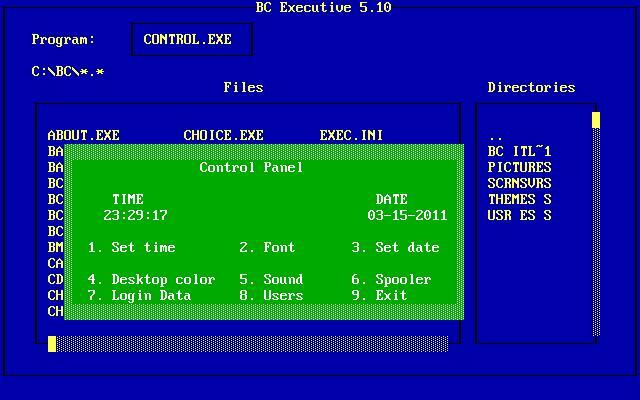 NOTE: This TUI must be unzipped to the C:\ so that all files reside in "C:\BC"
BCOE is a simple TUI centered around a file manager called "BC Executive 5.10" (5.10?). There are some simple programs included in the TUI which provide extended functionality such as themes (colors of different text and panels) as well as BC Write which appears to be very similar to UW-Write by UnderWARE Labs. Most of the programs are simplistic and none use the mouse. The BC Executive crashes when going to certain directories (maybe because I'm running it in DOSBox - author warns against using it) and sometimes prompts me with a "Drive Error" notification. For the most part, the TUI needs some work but the author is very ambitious towards making a useful operating environment package.